Subtitled ‘the best and most popular flies’, this is a selection of fifty, largely fully dressed, salmon flies, although there are a few hairwings in there. Each spread shows a picture of the fly itself, together with a short account of the pattern and the dressing - although I should point out that this is not a book particularly aimed at fly tiers, although it could be used as a source. The list will look strange to modern eyes, as many of the patterns hardly get an airing nowadays, but the contents reflect the history of salmon fly development and of Hardys’ association with it. 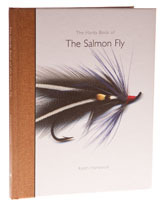 The Hardy Book of the Salmon Fly might be slim, but it makes a very good introduction to the subject and would make a wonderful present to anyone who has recently taken up an interest in salmon fishing.